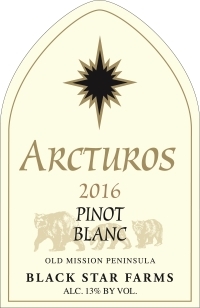 Pinot Blanc is a wonderful addition to the Arcturos line of dry white wines. This grape varietal grows well in our Northern Michigan climate. This vintage has beautiful aromatics, lush fruit flavors and an overall balance that make it a great white for many different occasions. Fresh apple and lemon notes with a subtle creaminess highlight this crisp and refreshing wine. Enjoy this wine young or age for two or more years for a broader palate presence. Lightly seasoned seafood appetizers and entrees (think shellfish, sea scallops & oysters), rich game birds, smoked ham and lemon cream based pastas. As the clonal cousin to Pinot Noir, Pinot Blanc has similar characteristics in its development. It can be alluring when young yet develop much broader personality and depth with proper cellaring. From Anonymous of Grand rapids, Michigan on 12/24/2017 . This is my favorite white wine. Dry crisp and delicious. Perfect on a warm summer evening.